FORMER PROSECUTOR NOW FIGHTING FOR YOU! "We Got Our Money's Worth"
"The Best Lawyer I Could Have Had"
"One of the Most Talented & Effective Lawyers I've Met"
"Did An Outstanding Job On My FELONY"
Are you the target of a criminal investigation? If so, you’ll need the help of an experienced and able criminal defense attorney. 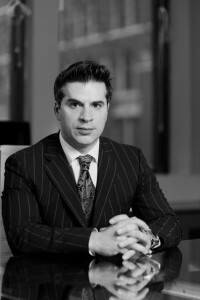 Christian Capitaine is a former prosecutor with over a decade of experience in the field of criminal law and looks forward to assisting you if you need help. He understands this is a very stressful time for his clients and fully devotes himself to vigorously defending the most important right we all have: freedom. 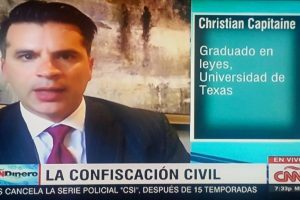 Houston criminal defense attorney Christian Capitaine has earned his reputation as a top criminal defense lawyer by delivering results, not empty promises. Call Houston criminal lawyer Christian Capitaine to discuss your case and to learn more about your rights. The Capitaine Law Firm handles all felony and misdemeanor cases. If you or a loved one has been charged with a criminal offense, do not underestimate the importance of having a top criminal lawyer fighting for you. 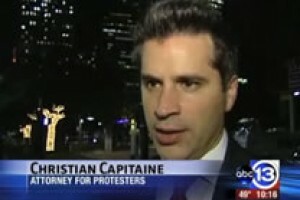 Christian Capitaine, a former prosecutor with Harris County, has been successfully representing clients in the field of criminal defense for over a decade. His years of experience as a Harris County prosecutor gives him a unique insight into how the other side works and, more importantly, what strategies are most effective to achieve success for his clients. His remarkable success, in and out of the courtroom is, no doubt, due to his relentless search for evidence favorable to his clients’ cause. He has dedicated his career to vigorously and passionately protecting the constitutional rights of his clients. He is widely recognized by his peers for his outstanding trial advocacy skills. 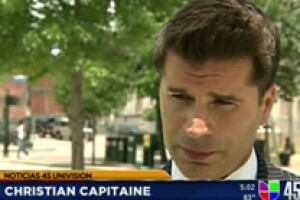 If you’ve been accused of a crime, whether guilty or not, contact the Capitaine Law Firm. If you’ve been accused of a criminal offense in Houston, and are looking for an experienced criminal defense attorney to represent you, contact attorney Christian Capitaine immediately by calling the law firm direct at 832-618-7831. Mr. Capitaine understands that a reputation is not built on empty promises. Instead, it is earned by delivering results. Towards that end, once he is hired on a case, he fully devotes himself to aggressively defending the rights of his client. Every lead is vigorously pursued, every effort is made to find evidence of his client’s innocence and to find an effective defense strategy. 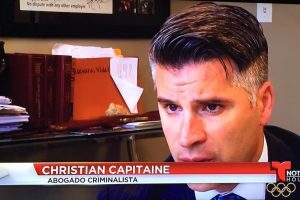 Mr. Capitaine is widely recognized for excellence in the field of criminal defense and this fact, along with many unlikely victories on behalf of his clients, has resulted in Mr. Capitaine being asked to speak as an expert on issues related to criminal law to different media organizations. Being charged with a crime is without a doubt one of the most stressful and devastating events a person can experience. If you cannot reach your attorney to have your important questions answered, your anxiety and stress levels are needlessly exacerbated. Mr. Capitaine values keeping his clients informed and believes a good lawyer should also provide moral and emotional support to their clients. His policy is to return phone calls within 24 hours and to give every client his cell phone in the event they need to reach him afterhours. Too many criminal defense attorneys take a very passive approach to defending their clients. There is a tendency among criminal lawyers to wait and see what evidence the State has after the first few court dates, and to then simply react to that evidence by conducting an investigation at that point. Unfortunately, this approach can lead to loosing on the opportunity to obtain helpful evidence including, for example, video surveillance evidence or potentially favorable witness statements. The reality is that the most important and crucial stage to begin working on a criminal case may very well be immediately following a client’s arrest or before charges are filed. By doing so, an effective criminal defense lawyer is likely to uncover favorable defense evidence and potential witnesses.